Morning of April 16, 2018. Monday. My dream starts out on a public beach, yet at no point am I aware of the ocean. Apparently, Zsuzsanna and our children as they appear now are present, but I am eventually most aware of our youngest son being nearby. I come to understand that many children had lost their toys in the long stretch of beach sand. 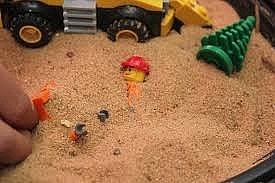 Here and there, I dig and I find mostly Lego; a lot of small bricks and a large one at times. I know that our youngest son will want some of them. There are also other parts found from older Lego kits, including plastic Lego figures. The sensation of digging with my hands is very realistic and vivid. I eventually reach a small square area on the beach that looks like some sort of ambiguous utility structure. It is somewhat like a small transformer station. Inside, on the ground, though there are a couple very small concrete partial floor sections, there are a few Lego platforms that have simple maze features and look as if they were designed to make a miniature maze by putting the platforms together as well as add separate smaller features over the connected platforms. These other pieces are mostly flat, but with sparse raised patterns (though raised less that a quarter of an inch) that imply part of a simple maze. I consider that our youngest son might enjoy them and I take them to put aside as well. I have a large plastic bag to put all the pieces in. Without paying any attention to the change of setting, I am soon digging in the wooden floor, though which is still somewhat like digging in beach sand, of the hall of the second storey of the King Street boarding house (where I have not lived since 1990), rendered as having a searchable essence as in a number of other recent dreams. At this point, even though my current conscious self identity was mostly extant at the beginning of my dream, I am now slipping back into a reversed timeline, where I do not realize I am in the “wrong” setting - and my current conscious self’s memory is now far less viable. Instead of Lego, which is autosymbolism for gathering and constructing my thoughts and identity, and to remember I have a young son, I lose that focus entirely and am now finding stones of an interesting appearance. Leonard S comes up to see me, though remains at the opposite end of the hall. He seems cheerful and is going to get some additional stones from downstairs. Meanwhile, the King Street landlady comes up to see what is going on and seems somewhat annoyed. She remains standing at the opposite end of the hall from me as well. Eventually, I find a large magnetic object near a fictional window on my end of the hall. (In real life, there was not a window in this location, my dream falsely implying the end of that area of the house, but the door to Leonard’s room as well as a smaller hall perpendicularly leading to the right and the left open to a staircase to the downstairs area.) It is not a stone but some sort of unusual ovular (though irregular) magnetic object with at least three large flat magnets arranged around its surface. They are somewhat like oversized refrigerator magnets. Each magnet features a scene from “101 Dalmatians” from 1961. One magnet features dalmatians, including Pongo and Perdita, the others, the human cartoon characters Roger and Anita. A similar object is nearby. I consider that the objects are meant to be placed together. However, when I touch them together all the flat magnets fall off from each. I start talking about this event to an unfamiliar cheerful male who is now suddenly sitting in the window. I try it again, after placing the magnets back on, but they fall off again. I am trying to understand if this is “right” or not, but the unlikely scene and erroneous magnetism does not trigger lucid awareness. The personified preconscious atypically takes on the essence of reinduction (as with the personified unconscious but of which is most often female) and sits in a low-set window rather than standing by or within a doorway, its usual habitat. The magnets did not continue to stick when the two objects were joined, being autosymbolic of the failure of the conscious self to fully initiate (the window otherwise implying the potential exit point for this dream). To summarize dream specifics: Water (no longer present in this atypical dream sequence) subsiding from liminal space as the very common (since early childhood) tidal analogy of waking autosymbolism. Seeking to gather current waking life identity. Small transformer station as autosymbolism for RAS (Reticular Activating System). My dream self finds curiosity in the maze-like neural gating potential of the dream state and becomes distracted. Trading one liminal space for another (beach to hall). Personification of neural gating at dream’s outcome, which very atypically represents reinduction rather than waking.